Maximum energy for the long haul. Power and recharge your battery faster than ever with the technology of this 30-watt highly efficient mono-crystalline solar panel that can be linked to other panels for maximum energy. 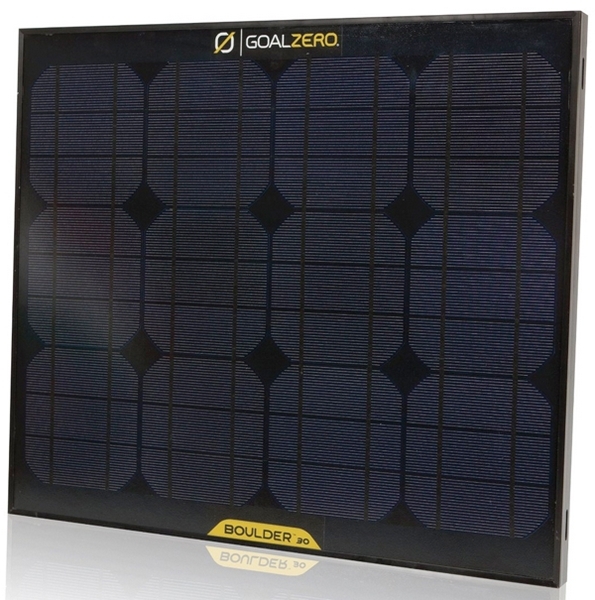 The Boulder 30 solar panel does not hold a charge it produces power when it is exposed to sunlight. You can store the power it produces in a portable recharger. The Boulder 30 can be used to power any Goal Zero recharger. This Solar panel delivers up to 30 Watts of power, but the angle of the panels and the cloud coverage can impact its performance. Avoid the shade. It will not work indoors.